Julia Sun Joo Lee says African-American literature is American literature. Dr. Julia Sun-Joo Lee has gotten used to the strange looks that sometimes greet her on the first day of class. “My students may initially be surprised to see me in the classroom,” says Lee, who teaches African-American Literature at the University of Nevada, Las Vegas. Lee, who is Korean American, earned her Ph.D. in English and American Language and Literature from Harvard University in 2008 and credits Dr. Henry Louis Gates Jr. with piquing her interest in African-American and transatlantic literature. After the 1991 police beating of Rodney King, she watched as her parents—who immigrated to the U.S. from South Korea in the 1960s—struggled to protect their liquor store against wanton violence from the looters who took to the streets to protest the incident. Coming from a mono-racial upbringing, Lee says that her parents quickly evolved and came to understand racial strife and tensions in this country. Desperate to return back West after earning her bachelor’s from Princeton University in 1998, Lee spent several years teaching 19th century British literature to high school students before she decided to pursue a graduate degree at Harvard. Marymount University where she taught a variety of courses ranging from first-year composition to African-American literature. In 2010, Oxford University Press published The American Slave Narrative and the Victorian Novel, a book that has been praised for its detailed examination on the American slave narrative’s influence on the Victorian novel in the years between the British Abolition Act and the American Emancipation Proclamation. 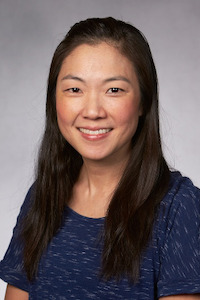 In 2011, Lee won a two-year postdoctoral fellowship at the University of Southern California and joined the faculty last year at the University of Nevada, Las Vegas—her first tenure-track position since earning her doctoral degree. Still, in her short time on campus, she has already made a tremendous contribution, says Dr. John Valery White, executive vice president and provost at UNLV. “Dr. Lee is trilingual and is truly a proficient emerging scholar who has pursued growth and excellence beyond boundaries,” says White. Lee, who is currently working on a book about racial representations in the comedy series, “Our Gang,” says that her experience at UNLV has been rewarding thus far. “Everyone here is brown,” Lee says of the institution where more than half of the students, according to university officials, self-identify as racial minorities. “White is the minority here.” In fact, Hispanic students make up the largest minority undergraduate student group at UNLV, at 19 percent. Many of Lee’s students are first-generation college students, who also hold down full-time jobs while pursuing their degree. They are surprised, she says, when she tells them of a time when many of the casinos did not allow African-Americans to gamble and where life in Las Vegas wasn’t much different from the Jim Crow of the South.